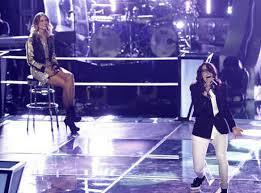 The Voice is on the final night of the Knockout Round and it was two hours long! That along was an added treat! Tuesday night was all about Team Blake and Team Usher. Just in case you need to be reminded, here is how the Knockouts work. Each coach pairs two members of their team to sing against each other. There are no second chances and there are no steals. The extra treat is that the contestants get to make their own song choice. There is only sing your heart out and hope that it is enough to impress the coach. Next week, the Live Shows start and America gets to vote! Now that you have a better understanding of how this round works, let’s get you caught up on what you missed on The Voice April 30, 2013. Savannah Berry and Justin Rivers were paired together because they are both country with a pop twist, according to their coach. Savannah performed “As Long as You Love Me” by Justin Bieber. She wanted to take a pop song and give it a country twist. She not only did in her singing, but she also played the guitar during her performance. Justin Rivers performed “The Climb” by Miley Cyrus. Although he struggled to let go of his gospel background to perform the song, he put his on twist on it by adding such power to the lyrics. Blake selected Justin to go on to the Live Shows. Follow Justin on twitter @justinrivers. Holly Tucker and Luke Edgemon were paired together because of their gospel sound. Holly performed “Live Like You Were Dying” by Tim McGraw. She loves the message in the song and can feel it each time she sings. Luke performed “Teenage Dream” by Katy Perry. He wanted to do this song because it is out of the norm for him. Holly will continue on Team Blake. Follow her on twitter @hollytmusic! Danielle Bradbery and Taylor Beckham were paired together because even though they are young, Blake wanted to see who will be more confident. Danielle performed “Jesus, Take the Wheel” by Carrie Underwood. With this only being her third major performance, a ballad was a lot for her to do, but she stepped up to the challenge. Taylor performed “Russian Roulette” by Rihanna. Although she did a beautiful job, it wasn’t the right song choice for her voice. Danielle will continue to the Live Shows. Follow her on twitter @dbradbery. Grace Askew and The Swon Brothers were paired together. They are both country artists and Blake wanted to see both of them have a classic country sound. Grace performed “I Can’t Stand the Rain” by Tina Turner. She performed this song because she wanted to show a different side other than country and add some soul. The Swon Brothers performed “Drift Away” by Dobie Gray because it is a timeless song. Blake selected The Swon Brothers to continue on the show. Follow them on twitter @theswonbrothers. Blake will go into the Live Shows with a team full of country singers. Josiah Hawley and Jess Kellner were paired together because of their distinctive tones. Josiah performed “Back to Black” by Amy Winehouse. He wanted to show a different side to his style. Jess performed “You Give me Something” by James Morrison. She connected to that song because of her mom. Josiah will be continuing on the show. Follow him on twitter @josiahhawley. Audrey Karrasch and Michelle Chamuel were paired together because of their distinct voices and their genre being alternative . Audrey performed “How to Love” by Lil Wayne. She was trying to show another side to her music. Michelle performed “Raise Your Glass” by Pink. Although a pop-rock song, she was able to add an alternative twist. We will see Michelle next week. Follow her on twitter @michellechamuel. C. Perkins and Vedo were paired together because they are both R&B singers. C. Perkins performed “She Ain’t You” by Chris Brown. He wanted to perform a strong song that showed off his style and some of his energy. Vedo performed “Everything I Do, I Do it For You” by Bryan Adams because of his personal connection with the song and his mom. You could feel his emotion as he sang the song. Usher selected Vedo as the winner of this round. Follow him on twitter @vedothesinger. Cathia and Ryan Innes were the final performances of the night for Team Usher. They were paired together because they are both emotional singers and he wanted to see who could make him feel the music. Cathia performed “Mr. Know It All” by Kelly Clarkson. This was her first time singing in English on the show. Ryan Innes performed “I Don’t Wanna Be” by Gavin DeGraw. He picked the song because he wanted to be known as more than a soul singer. Cathia will remain for the Live Shows. Follow her on twitter @cathiasings. Usher will be going to the Live Shows with a very diverse group.